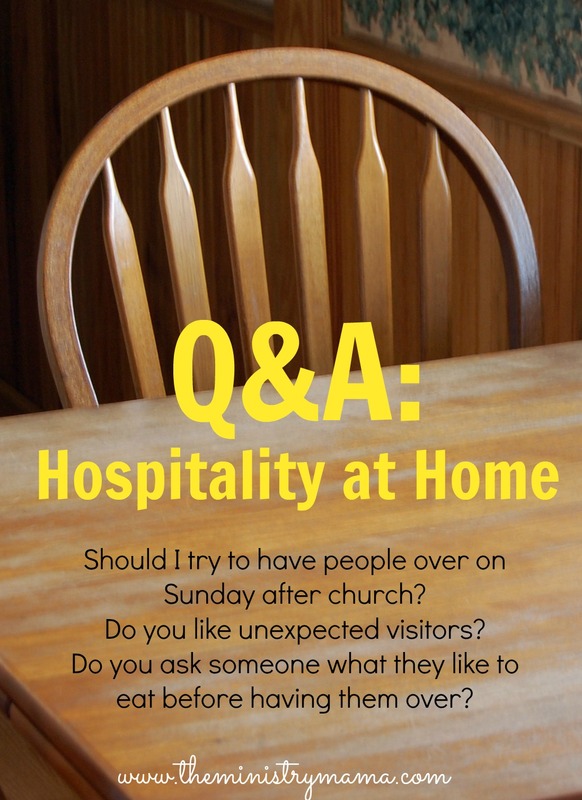 Home hospitality is always interesting when you are in the ministry because while our home is our safety zone, it is also a place in which we can minister to others outside the church in a special way. The following questions are not particularly spiritual in nature but the answers are interesting and many have some wisdom contained in them and even some humor too. Q: Is it proper to ask people what they like or don’t like to eat before having them over to your home for a meal? I find myself asking this because I’d rather them enjoy the food. “My wife does so religiously. I think it shows a true spirit of hospitality.” ~J.O. Q: We are so busy on Sundays that I really dislike having company over after church for lunch or dinner… should I try to have people over anyway? or try another day of the week? “I know how you feel. I feel that way too very often. Sundays are hard. We are tired, but when we begin to make excuses like this are we really “ministering” to people or just showing up to do our job? Ministry at its very basic definition calls for serving through sacrifice. Sometimes that means missing my Sunday afternoon nap. Now, I’m not saying that every week you must have someone over for Sunday lunch. But what about once a month? And if Sunday lunch is too hard, what about snacks after the evening service? Through the week is great too, but I do feel that hospitality on occasional Sundays naturally lends itself to much more in-depth spiritual conversation. And, our children learn from us. Do we want them seeing our dislike for Sunday company? It just takes prayer and planning, but it truly is worth it.” ~K.M. “Don’t be afraid to say no. We have a life just like others. If it does not conflict with your schedule – say okay, but if you are worn out, kids are worn, and your husband needs rest, say no. Choose another day during the week.” ~R.F. Q: Do you like people to pop by your house unannounced? or do you like to have a little notice? “Notice for sure, at least half an hour.” ~G.G. “A little notice is always nice, but sometimes a surprise friend showing up is the best!” ~R.A.B. “It depends on who it is for me. I like a little notice, so I can make sure my house is presentable to company. They are always welcome regardless of what the house looks like.” ~A.M. “I love it when people drop in.” ~C.W. “Especially since we have had a break-in, I am very wary of people at the door when I am not expecting someone. I may even have the house alarm set, so a ten minute heads up is good with me.” ~A.F. ” I think, and this is just how I think, that when a friend drops by unexpectedly, that friend trusts that they will be welcomed, since the ‘polite’ thing to do is give notice. They know that no matter the state of your house or what you’re doing, you’ll welcome them in gladly. I’d be thrilled if a friend just popped by because in my mind, it demonstrates trust.” ~J.H. “Notice is awesome, but I try my best to be ready…. I would never want to miss an opportunity to help someone in the moment.” ~A.N. “We moved to a small town last year and I am getting used to people popping in all the time. In the city, people would usually call before coming by, but here, my neighbors, church folks, and multiple kids stop by throughout the week. At first, it was awkward, but now I love having company! I have learned not to worry so much about my house and just focus on the person visiting. Love small-town life!” ~T.O.P. “No! If someone shows up at my house unnoticed they may not like what they see! LOL!” ~L.G. If you are interested in contributing a question for our ministry Q&A blog posts, please contact me through e-mail! Once upon a time I wrote an article about how I react when I find out guests are coming. The Lord has taught me that while I get ready for guests, I still need to value and be respectful to my family. Read The House Guest Shuffle here. I am excited to share with you my first contribution to The Young Wife’s Guide. This is a website that encourages young wives in spiritual and practical ways on how to be a better wife, mother, and woman. Lord willing, I will be contributing once a month on their blog on different topics. So go take a look at how you can learn about Heavenly Hospitality from God and His hospitality to His home, heaven. If you would like to learn more about Gospel Centered Homemaking then please visit The Young Wife’s Guide. I love her section about 5 Days of Glorifying God in Your Homemaking, it has many articles and links where you can learn more about setting the atmosphere of your home, taking charge of your family’s health, managing your home, and managing your family’s stress. This is an exciting day for me to get some new exposure and to share not only more about The Ministry Mama and minister hopefully to more ministry women, but to share more about God’s Word and His teaching from the Bible. Thank you for joining me today for my new adventure!